Note: This is a guest post by Apostle Mengoulis - Who's a Growth and Content Hacker at GrowthRocks. His aspiration is to share knowledge through interesting and fun content around growth hacking and digital marketing. You can catch up with his latest articles at Growth Rocks Blog. A Growth Hacker, is something like a super-mutant of the internet marketing era. He is balancing between marketing and engineering, extracting elements from both worlds, always aiming at achieving his ultimate and only goal: Growth! Trying to define the Growth Hacker, is a hell more difficult than you might think it is (and I thought too), as there is no standard formula of success to use and every product needs a different approach as it comes to its growth. A war takes place in the internet business field, and Growth Hackers are called to choose what their role in every battle should be in order to win. 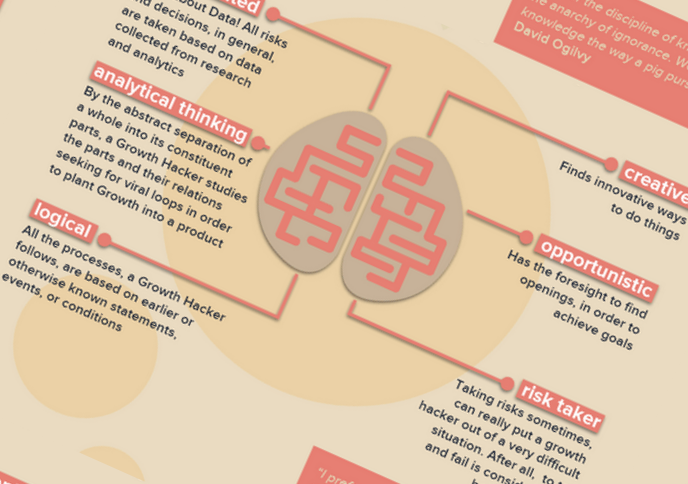 This infographic, visualizes the main characteristics of a Growth Hacker while presenting some of the most important attributes, skills and also the concept behind his/her mindset.